Since 2008, the village of Feldheim has had its own biogas plant with an installed electric power capacity of 526 kW. The plant is operated by the local agricultural cooperative. The annual biomass input is 8,600m³ of manure, 8,700 tonnes of maize and 190 tonnes of wholegrain cereal. These raw materials are produced and supplied by the agricultural cooperative. The plant generates 4 million kWh of electricity a year, which is fed into the public grid. The heat produced during power generation is fed into a separately installed district heating grid that supplies the local inhabitants, the livestock farms and commercial enterprises with heating. Each year, around 15,500 m³ of livestock manure are produced as a by-product of power generation and supplied back to the agricultural cooperative. Due to their village being self-sufficient in respect of heating energy, the inhabitants of Feldheim save 259,000 litres of heating oil every year. This means they are not only helping to create a cleaner environment, but are also saving money. 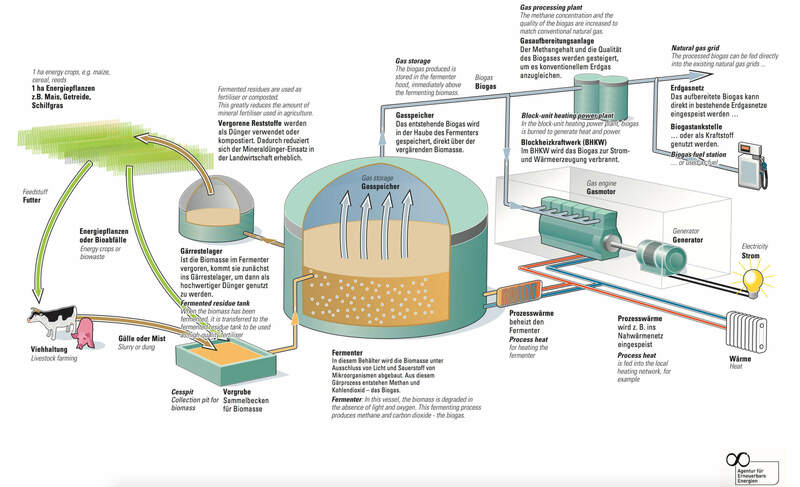 Bioenergy is obtained from biomass – i.e. from all vegetable and animal materials, their conversion products and from organic waste suitable for energy extraction. This means that biomass is basically nothing other than solar energy that has been chemically bound by plants with the aid of photosynthesis. Biomass from renewable raw materials is considered a renewable energy source because the amount of CO2 released when it is converted into another form of energy is exactly the same as what the plants previously withdrew from the atmosphere during photosynthesis; biomass is therefore considered t o be ‘CO2 neutral’. It has been used as a source of energy since the dawn of humanity, namely by burning firewood. More modern and more efficient forms of biomass use include the production of biogas by fermentation, or of wood gas by wood gasification, or by producing biofuels by extracting the oils in biomass (e.g. in rapely) and transesterifying them. However, the original use of biomass – burning – still continues, but in more modern forms such as the combustion of pellets and briquettes. 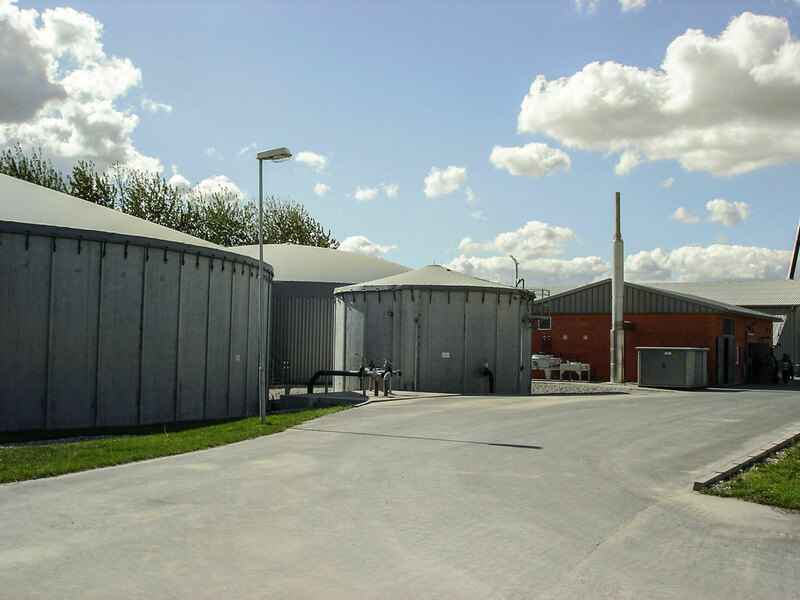 Biogas plays a paramount role in the use of biogas. The raw materials used are biodegradable substrates such as energy crops (maize and grass silage), slurry, agricultural by-products or biowaste. The biomass is ‘processed’ by microorganisms to produce a gas that mainly consists of methane (CH4) and carbon dioxide (CO2). This gas can then be used to fire block unit heating power plants; if the heat generated is used for cattle breeding, for example, a particularly high level of efficiency is achieved for the raw materials used. The methane concentration and the quality of the biogas can be improved by suitable processes in order to substitute it for conventional natural gas. Finally, the fermentation residues are used in agriculture as an almost odourless, high-quality fertiliser.